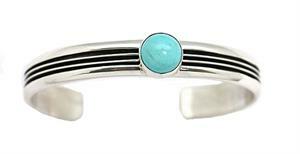 Sterling silver 2 rail / 3 groove bracelet shank with a 10mm round kingman turquoise stone. Shank measures 3/8" wide. It is Navajo hand made by Chester Charley. Color shade of turquoise may vary.